It’s been 3 weeks since the launch of our new website and our launch party Puppies & Prosecco and I still feel like I’m on a high from it all! I honestly never thought when I started the Facebook page that just a bit of fun would grow to have such a huge following and become a go to page to find out all the places which will welcome your dogs in Perthshire. I’m so pleased to see it is benefiting so many dogs and their owners as well as many businesses who are dog friendly. 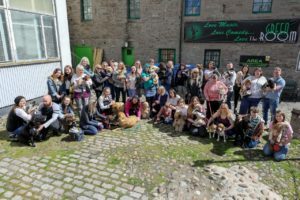 It only seemed right if we were having a launch party that the people who follow the page and have helped it grow into such a success celebrated with us and what a better way to do that than by holding an event where dogs and their humans are welcome! Puppies & Prosecco seemed the perfect way to celebrate too! I still can’t believe how quickly the tickets sold out! I had a feeling it was going to be popular but had no idea the tickets would sell out within 24 hours. I still feel shocked thinking how quickly they sold but in a good way! It was nice seeing so many people (and dogs!) were wanting to be part of the celebrations. Thanks to The Green Room which is the largest dog friendly venue in Perth, we had the perfect place to hold Puppies & Prosecco. We had enough room to accommodate everyone upstairs and The Green Room kindly let dogs and their owners in the downstairs bar too and it was turned into a bit of a chillout zone. The backzone upstairs was where our stallholders set up and was constantly busy. A big shout out needs to go to Perth Pet Care, Angie Gray Pet Portraits, Daughter of the STAG, Molly & Co., Lemon Pip Organic Dog Biscuits, Auntie Clare’s Pet Services, The Dogs Paws, Henry & Co, Ozello Fibre Creations & Pawtraits, Scruff Muffins and Bug Bakes our fantastic stallholders. Baxter said he saw lots of dogs spending their pawket on lots of treats! We also had the incredibly talented Strathearn Snapshots Pet Photography who came along with their pop up photo booth. I think as soon as the doors opened Lynn was non stop till the end of the party taking pics of peoples gorgeous doggies! It was great seeing it so popular and we would definitely have a pet photo booth again for future dog friendly events. With wanting the party to be as much for dogs as us humans there were other little things we did to include them in the day. Each dog that attended got their very own doggy goodie bag that included a pic & mix of biscuits, a cupcake, poo bags, 2 peanut butter chews and a tennis ball. The extremely talented Elaine from Perth Pet care even made a special cake just for dogs and modelled it on the main man himself, Baxter! It was great seeing so many dogs tuck into their treats and enjoy themselves. 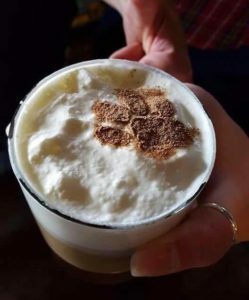 The talented staff from The Green Room made special cocktails with a doggy theme for us humans and of course I had to sample one or two (possibly 4!) especially the one named after Baxter, Baxter’s Bark! At one point I will admit when we had the group photo outside I had a moment of panic seeing so many dogs and wondered what is going to happen with so many dogs in the one space!?! Fantastically though, it all went fine! There was no upsets, no dogs not getting along. There was the occasional bark but with so many dogs in the one place that’s to be expected and it was more barks of excitement and wanting to say hello. It was lovely seeing so many dogs from dachshunds, Chihuahuas, a gorgeous border terrier and golden retriever puppy to labs, a few sproodles,a husky, spaniels a rottweiler and many more breeds of all shapes and sizes getting along. Baxter made loads of new pals too which he loved! When planning Puppies & Prosecco I thought it would be great if we also did something to raise funds for our local dog charity PADS. PADS have been helping stray and abandoned dogs across Perth and Kinross for over 25 years and I have a huge amount of respect for the work they do. We thought the best way we could raise some money would be with a raffle and who doesn’t like a raffle!? I have to say I’m still completely blown away by the businesses who donated kindness and generosity with the prizes. I think we can all agree that the prizes donated were just incredible! 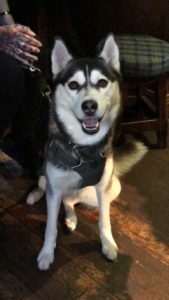 There was a bungee jump, a two night dog friendly holiday, tattoo vouchers, various vouchers for dog friendly cafes and restaurants, personalised dog portraits, bottles of fizz….The list just goes on! In the end nearly £1200 was raised for PADS!!! This is just an amazing amount and I can’t thank everyone enough who donated such fab prizes and who bought raffle tickets. A huge thank you needs to go to Elspeth, Richard, Burach and the girls from Brew & Chew who presold raffle tickets to people who couldn’t attend Puppies & Prosecco. From their raffle ticket sales alone they raised £424 so thank you guys for all your support! The whole day was such a fabulous success and I feel very blessed and lucky with having the support of so many wonderful people to make it that way. 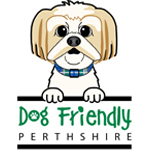 Not just with how Puppies & Prosecco went but with also the launch of the new website for Dog Friendly Perthshire. Our long term goal is to put Perthshire on the map as the top place in Scotland to visit and holiday with your dogs. 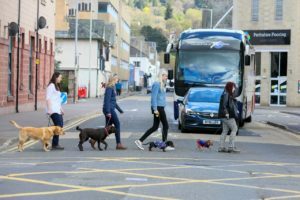 There is so much available in terms of dog friendly accommodation, shops, pubs, restaurants and walks in Perthshire and we want to highlight that even more and reach out to dog owners across the UK and make it the top tourist destination for dog owners as well as letting local dog owners know what places they can visit too with their four legged companion. With Dog Friendly Perthshire we really want to build a doggy community with dog owners and dog friendly businesses. 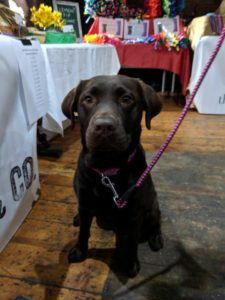 We are hoping to organise a variety of different doggy events throughout the year and bring dog owners and businesses together as I believe that in Perthshire we are ‘leading’ the way with being dog friendly in Scotland. We have already teamed up with Perth Playhouse for a dog friendly cinema screening on the 17th of June and Perth Perth Care for a Hawaiian themed party on the 24th of June which you won’t want to miss out on! 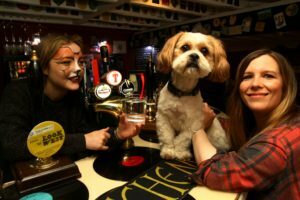 We are definitely taking the title as the Dog Friendly Capital Of Scotland and Baxter is determined to keep sniffing out all the dog friendly places for him and his doggy pals to enjoy! A big thank you to everyone who attended and took pics of the event and thank you to Mark Fraser, The Courier, The Evening Telegraph for also taking pictures.